East Serbia is one of the five statistical regions of Serbia. This region and others were officially formed in 2010, but East Serbia has been the administrative region since 1918 when the Kingdom of Serbs, Croats, and Slovenians was formed. East Serbia covers an area of 26,255 km2 (10,137 miles2) and has a total population of 1,563,916 according to the 2011 census. The statistical region of Southern and Eastern Serbia is composed of 9 administrative districts, 53 municipalities, and 1973 settlements (Fig. 1). This region became part of Serbia in 1913 after two Balkan wars and more than 400 years of Ottoman occupation. It is predominantly mountainous with river valleys between the mountain ranges. The region is bordered in the south by the Former Yugoslavian Republic of Macedonia, with Bulgaria to the east, Romania at the east and the north, the Autonomous Province of Vojvodina in the north, and Central Serbia, Kosovo, and Metohija to the west. Three districts Toplički, Jablanički, and Pčinjski were divided into a separate region (South Serbia), which was combined with East Serbia in 2009. East Serbia is economically the most undeveloped region of Serbia with an aging population and also emigration. While there are numerous researches on this region, only a few will be mentioned. Some of them investigated demographic characteristics of settlements (Babović et al. 2016; Vulević and Knežević 2017; Mihajlović 2014; Knežević 2013; Lukić 2011; Lukić et al. 2012, 2014b; Miljković et al. 2015) and others the aging population in the region (Magdalenić 2016; Mihajlović 2013, Bubalo Živković and Djerčan 2014; Lukić et al. 2014a; Djerčan et al. 2017; Stojsavljević 2018; Stojsavljević et al. 2013). 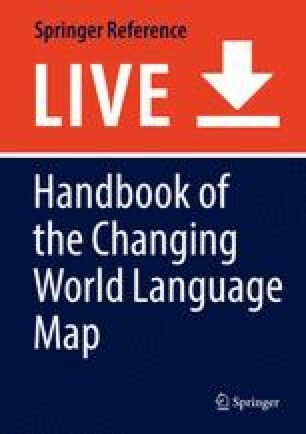 One of the best books about characteristics of world languages is The Handbook of Language and Globalization, edited by N. Coupland (2010), and one of the best on languages in Serbia is Language and Nationalism in Yugoslavia, by Magner (1967). Population census data from 1921, 1931, 1953, 2002, and 2011 are also used in this discussion. It has been 7 years since the last census, so half a cycle has passed until the next population census, which should be held in 2021. It is worth noting how the structure of population has changed. In the 2011 census, the region had 1.5 million inhabitants. Of that number, 96% declared Serbian as their mother tongue (1,426,852 people). 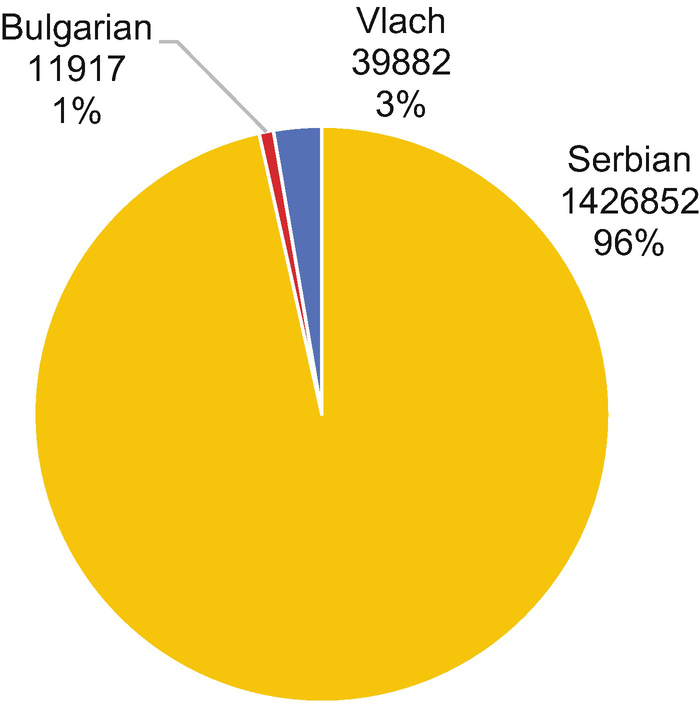 The other two languages worth mentioning are Vlach with 3% (39,882 people) and Bulgarian 1% (11,917 people) (Fig. 2). The most dominant Serbian language district is Dunav district (96.1%) and the lowest percentage is Braničevo district (85.2%). If one considers representative mother tongues according by municipalities, the highest percentage of population declaring Serbian as its mother tongue is Trgovište (99.1%) and the lowest percentage is in Bosilegrad, only 16.1%. The Albanian language in East Serbia is represented to a greater extent in Preševo (13.5%). At this point attention must be drawn to the fact that in Preševo municipality the Albanian minority boycotted the population census; the reality is that the percentage of population who would declare Albanian as their mother tongue is without doubt much higher. The Bulgarian language has an absolute majority in Bosilegrad (81.2%) and it is also significant in Dimitrovgrad (34%). Vlach language as a mother tongue is significant in Bor region – 13.9% (municipalities: Bor, Majdanpek, and Negotin) and municipalities: Kučevo (30.1%), Boljevac (23.1%), and Žagubica (22.2%). The Roma language is significant in three municipalities: Bujanovac (25.2%), Bojnik (14%), and Surdulica (10.6%). In Bujanovac the Albanian minority also boycotted the population census in large numbers. Also, the percentage of population where the Roma language is the mother tongue is probably much lower. According to the 2002 census, the population of East Serbia region was 1,753,004; Serbian was mother tongue for 86.6%. The most dominant Serbian language is in Dunav district (97.6%), while the lowest percentage is in Pčinja district (66.3%). The highest percentage of population with Serbian as mother tongue was in Vlasotince (99.4%), the lowest percentage in Preševo (8.6%). This time the Albanian minority agreed to participate in the census. The Albanian language was a mother tongue for only 3.5%, the highest percentage is Pčinja district (24.1%), especially in the municipalities of Preševo (89.2%), Bujanovac (54.9%), and Medvedja (26.2%). Bulgarian language as a mother tongue was represented only with 2.4%, including the municipalities of Bosilegrad (73.2%) and Dimitrovgrad (39.4%). Vlach language is significant in three municipalities: Kučevo (37.1%), Boljevac (27.6%), and Žagubica (26.7%) with a total representation of 5.7% for East Serbia. According to 1953 census, the population of East Serbia region was 1,566,830. People who identified Serbian as their mother tongue were 76.9%. It is noted that in 1953 this language was not called Serbian but Serbo-Croatian. Since it was obvious that the number of Croats in this region was insignificant, we can relate this mother tongue with Serbian. The highest percentage of population for whom Serbian was mother tongue was in Vlasotince (99.7%). The lowest percentage was in Bosilegrad (1.9%). Vlach language was represented at 13.5% with a majority in Ključ (76.3%), Poreč (66.1%), and Zvižd (56.2%). The Bulgarian language was represented with only 6.2%, but had absolute majorities in Bosilegrad (97.9%) and Dimitrovgrad (94.2%). According to the 1931 census held in the Kingdom of Yugoslavia in the area which now consists of the region of East Serbia, there were 1,340,859 inhabitants. Of this number, 91.4% declared that Serbian is their mother tongue (although this language was called Serbo-Croatian-Slovenian-Macedonian those days). The highest percentage of the population for whom Serbian was mother tongue was in Bosilegrad (99.6%). During the World War II many Serbs migrated from this town due to Bulgarian occupation. The lowest percentage was in Aleksinac (30.3%). Albanian was significant in Preševo (39%) and Aleksinac (23.8%). It is interesting to note that Hungarian language was significant in Aleksinac (8.7%). Almost a quarter of the population of Aleksinac (23.8%) declared that some “other Slavic language” was their mother tongue, which is a rather “unclear” category. It is assumed that the Bulgarian language was one of them in the mentioned category. According to the 1921 census held in the Kingdom of Serbs, Croats, and Slovenians, there lived 1,268,388 inhabitants in the East Serbia region. Of this number, 85.5% declared that Serbian (Serbo-Croatian) was their mother tongue. The highest percentage resided in Smederevo (99.2%), the lowest percentage in Krajina (40.5%). The Romanian language was significant with 13%, with concentrations in Krajina (58.3%), Timok (25%) and Požarevac (20.1%). It can be seen in Table 1 that changes in the percentage of population for whom Serbian was the mother tongue varied slightly. The difference between 1921 and 1931 censuses was 6%. The percentage dropped by almost 15% after the World War II. The reason was the loses of the Serbian population during the war. During the communist regime 13.5% of the population declared that Vlach language was their mother tongue. Compared to the 1921 Census where 13% of population declared Romanian as their mother tongue, a clear link can be seen that people who declared Romanian as their mother tongue between the two world war periods changed to Vlach language after the World War II. They changed to Vlach due to Romania entering into the Warsaw Pact. It can be seen in Table 2 that the largest percentage of Bulgarian mother tongue in Bosilegrad municipality was after the World War II with a decreasing trend until 2002, when an increase is observed in the first census in the twenty-first century. Between the two previous censuses the percentage for whom Bulgarian is mother tongue increased almost 1% each year. This change can be explained by the fact that a large number of Serbs emigrated to other parts of Serbia or abroad. The percentage of Albanian language continues to increase between censuses (Table 3) except for the boycott in the 2011 census. Especially noteworthy is the trend after the World War II and the politics of the communist regime to make ethnically homogenous regions in Kosovo and Metohija and three municipalities in Eastern Serbia (Preševo, Bujanovac, and Medvedja). Due to the Albanian minority boycott to abstain from participating in the 2011 census, the percentage in that column is not realistic. Preševo is the municipality with the highest population that has Albanian as the mother tongue. That percentage increased up to almost 90% in the 2002 Census. That percentage is even higher today. Thus, it should not be seen as a minority population in 2011. 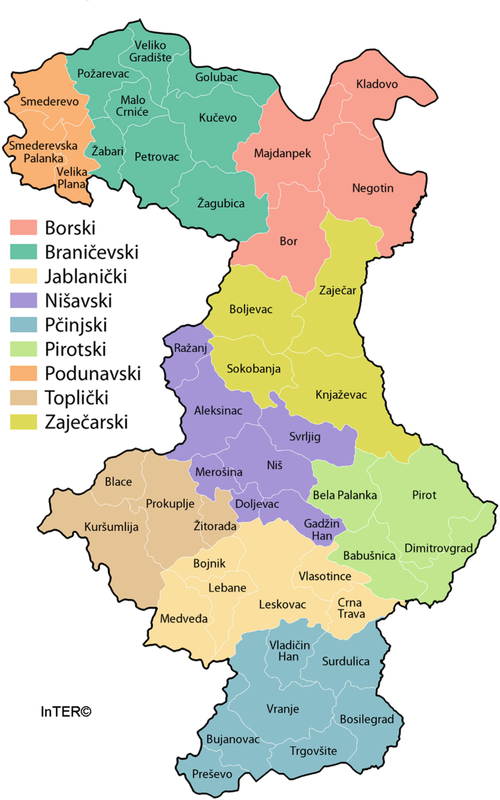 The East Serbia region became part of Serbia in 1913. Before that it was part of the Ottoman Empire. During both world wars, this region was occupied by Bulgaria. Nevertheless, this region is very homogenous; Serbian is the mother tongue to more than 90% of the population. Growing tensions between Serbs and Albanian minority in the future could cause problems and changes in the percentage of mother tongue in municipalities close to Kosovo and Metohija. It is also assumed that a percentage of Serbian mother tongue speakers will decrease in the future due to Serbian emigration from this region.